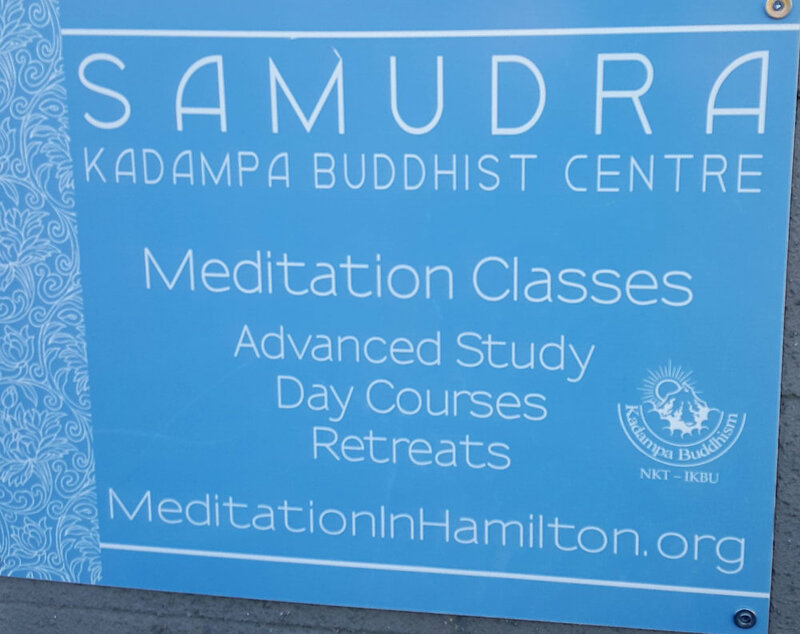 Today was my second visit to the Samudra Kadampa Buddhist Centre. I have been interested in Buddhism for quite some time, but never really knew how to "get started". I tired reading a book or two, but my choices turned out to read like stereo instructions - bland and complicated. I got a little better results when I turned to audio books, but my issue there was one of two things - I'd either try to only pay attention to the audio book, which would slowly put me to sleep; or I'd keep myself awake by performing whatever random task as I listened, which greatly reduced the amount of information I would take in, making it necessary to listen to the same chapters multiple times to absorb anything of value. Finally, after hitting what I'm pretty sure has been my worst (and hopefully my last) rock bottom, I sought out a proper introduction into Buddhist study. Wednesday morning, from 11am until about 1pm, is now my weekly "Zen time". Taught by Gen Kelsang Rabgye, the class begins with the Liberating Prayer, followed by a lecture on the given topic of the week (each week progresses you through a course curriculum), any questions may be asked at the conclusion of the lecture, we take a small break to socialize, discuss, and enjoy some tea and snacks, and then finish with a meditation. Today's lesson was A Mind Without Self Interest, the second last lesson in the course: Beautiful Mind Beautiful World. Self Interest, as explained, is basically our evolved survival traits to put our own needs, desires, wishes, and attitudes above those of anyone else. Makes sense in a primitive world, take care of yourself, because if your don't - who will?... However even in a survival prioritized primitive world, there was some fluctuation of prioritization of ourselves over others. An example of such fluctuation would be when a parent has a newborn. Whether we look at human or animal as example, the parent of a newborn will more often than not put the child's needs above that of their own. If food or shelter was limited, the newborns requirements would take precedence. In many cases, a parent would give up their life in order to save the child's. This shows us that self interest CAN be overcome. As a Buddhist trying to reach a higher level of enlightenment, and really for anyone wishing to be a better person, our goal is to lower the priority level of Self Interest and in turn try to raise your level of Selflessness. At the very least we should all aim to reach an equilibrium - our self interest equaling our selflessness. Creating equitable love between self and others would inherently bring us (as well as those we interact with) happiness. All creatures desire happiness, it is our driving force in life (first comes survival, then comes the search for happiness). If we remain in survival mode however, it will greatly blur what we deem to make us happy. For tens of thousands of years, through our evolution, we have become familiar with the need to survive. Thus, in turn to find and retain true happiness we must become unfamiliar with the need to survive... We must strive to develop a virtuous mind, as a virtuous mind will create happiness. To be virtuous, righteous, pure, to show high moral standards, is essentially to be selfless, or to have selflessness qualities. Selflessness is the polar opposite of self interest, in fact if one were to be truly selfless they would have a total abandonment of self interest. Having no self interest would bring about eternal and unlimited happiness. Selflessness is our path to freedom - an omnipresent desire to free all beings of suffering. To want to rid every other living creature from suffering, having completely abandoned all self interest and work solely for the benefit of others, is pretty much the definition of a Holy Being. Any religious or spiritual leader that could be considered a Holy Being, 100% was filled with a very powerful sense of selflessness. But as I said, this need for survival, which drives our self interest, is deeply rooted in our evolution. So to fight it proves to be extremely difficult. Small day to day changes is the answer. It is simple cause and effect, create enough causes over time, and we will create the desired effect. It is merely a conceptual habit.